If you’re like me, you sometimes browse for new treat recipes online that are fun to make and not total gut bombs. And if you do, you know that the days of recipes calling for a simple cup of sugar are long gone. Between recipes following paleo, raw, vegan, and gluten-free diets, you’re bound to happen upon recipes calling for agave, stevia, honey, or maple syrup. How much sugar is healthy to eat? I get a lot of questions about sugar… Does it really make a difference what kind of sweetener I use – sugar is sugar is sugar, right? How much added sweetener is okay to eat and still be healthy? Thanksgiving day is right around the corner. Personally it's my favorite holiday of the year, but it wasn't always. As a kid I was a very picky eater and didn't like most of the traditional Thanksgiving foods - I remember dreading that dinner for several days leading up to it because I was so embarrassed to not be eating turkey or potatoes or gravy. And now the pendulum has graciously swung so that I LOVE Thanksgiving foods. I do my best to eat in a way that will allow me to fully delight in the big family meal AND leave me feeling good the next day. I do believe you can have both! Below are some tips - first to help you think through the food choices you'll make and how you'll interact with loved ones on turkey day, and second are some eating strategies to help you feel great after dinner. 1. Decide to have pie NOW! When you make a conscious decision ahead of time to indulge in foods that aren't part of your daily diet, it helps to free you from the guilt of feeling badly for eating them. You are not 'caving' in the moment because someone is pressuring you to eat it or because it looks irresistible. You are in control and you decided that it is okay for you to eat pumpkin pie or stuffing or have that glass of wine on a holiday. So what is the right amount for you to indulge on Thanksgiving this year - is it 1 piece of pie and a beer? Is it 2 servings of mashed potatoes with cranberry sauce and an extra scoop of ice cream? Be specific in deciding what you want to indulge in, be honest with yourself about how you expect to feel the next day based on those decisions, and then don't let yourself feel guilty for following through with the plan. Or you may choose not to indulge this year - you may be in a stage of your healing journey that requires you to be a little more strict and stick to foods that you know will make you feel your best. This is also okay and you don't need to feel guilty for that either, which leads me to the next point. Eating is not just a method for sustaining our bodies, it is a communal experience that has familial, spiritual, and emotional dynamics. What you choose to eat impacts not just yourself, but also others. This is one reason why people react to one another based on food choices... we've all had a friend try and tempt us into dessert or another drink when we don't want one, then get annoyed if we refuse. If you choose to eat dessert along with everyone else, but someone at the table thinks you need to lose weight, they may judge you. If you choose NOT to eat dessert along with everyone else, someone may feel judged by you. I can guarantee that if you seek to eat healthfully (or even if you don't!) you will experience this type of negativity, and working through that is a huge topic for another discussion. I believe that it is a good rule of thumb to not draw attention to the food choices others make (even in compliments), especially in front of a crowd. They may feel embarrassed or isolated by a new food choice and don't want others to notice. And remember that if someone makes a negative comment toward YOUR eating choices, they may feel insecure because they think they should be eating like you but haven't been successful yet. Be gracious, try to change the subject, and understand that their comments say more about them than you. Often times folks avoid eating breakfast to "save up calories" or be extra hungry for turkey dinner. I do not recommend this method! Eating breakfast is an important way to start our metabolism and regulate our blood sugar. Eating breakfast that contains a healthy fat such as coconut oil, butter, or olive oil is a great way to regulate your energy throughout the morning and get you to dinner happy (and hungry). If you end up going on a walk after dinner, that is great, however I wouldn't bank on that happening as most people fall into a food-induced coma for the rest of the evening. Movement will help you digest your food, get your metabolism going, and give you a mood boost that many people need on a holiday. When you go through the buffet line or pass around the plates, try to start your plate off by choosing 2 veggie dishes and turkey first, THEN add in the mashed potatoes, stuffing, or bread that you'd also like. If you prioritize those dishes, you may find you have less room for the others but you can get a taste of all of them while still eating a nutrient dense meal. Not sure if there will be any veggies at your Thanksgiving meal? Offer to make my Pumpkin Apple Salad- I'm sure you'll get compliments for this fall themed dish. Got other good Thanksgiving tips to share? Questions or reflections on these tips? I'd love to hear from you in the comments section below. And from my family to yours - Happy Thanksgiving! you simply cannot beat the amazing list of nutrients that are so concentrated in liver: Vitamin A, B Vitamins, Vitamin D, and Vitamin K2, Iron, Zinc, Copper, Selenium, Potassium, Phosphorus, Sodium. This level of nutrition just isn't packed into many other foods. Read Liz Wolfe’s blog post to get a deeper look at the nutrition in liver. For pre-conception or prenatal health – Folate is a B vitamin required for DNA production so it is absolutely critical for healthy development of an embryo. Unfortunately, it is a vitamin that is depleted by excessive consumption of refined carbs and sugars. Fortunately, liver is incredibly high in folate! To promote antioxidant activity – Vitamin A is an antioxidant, which means it neutralizes free radical activity which causes inflammation, plaque buildup in the arteries, and a whole slew of chronic diseases. Liver is hands down the most abundant food source of Vitamin A. Immune health – Liver is a fantastic source of iron, which is necessary for proper immune function. Iron’s primary function in the body is to create hemoglobin found in red blood cells. Fun fact: Heme iron (the name for iron found in meats) and hemoglobin share the root word “Hemo-“ or blood. 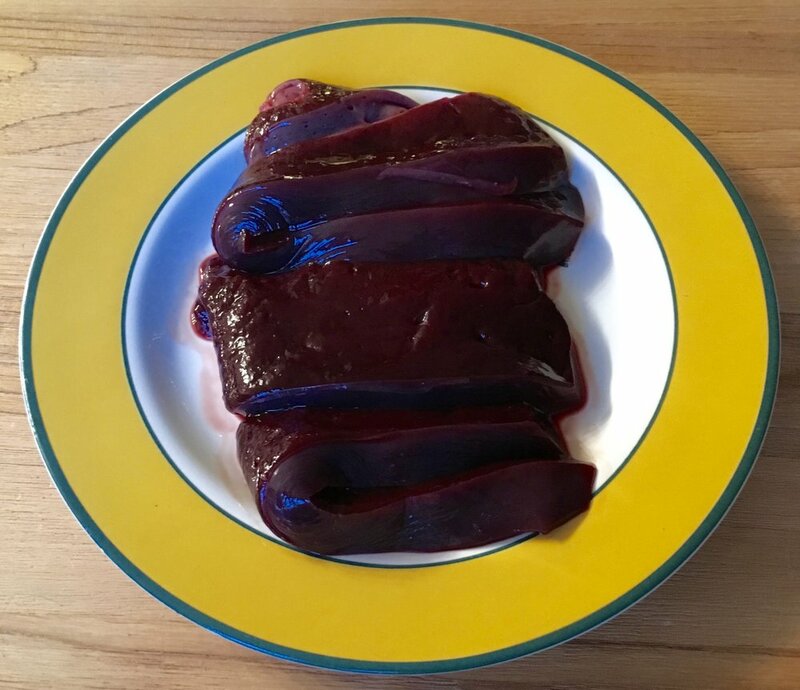 It is absolutely essential to eat organic, free range, grass fed (if from a cow) liver. Liz Wolfe puts it well – the liver is a filter, not a storage unit. However, filters can get clogged too, and this is why it is critical to eat liver from an animal that has been raised following humane practices with appropriate feed. I am a firm believer that if we are going to eat meat (which I think we should), as a society we need to return to being comfortable with the fact that chickens are not exclusively breasts and thighs. If we are to eat meat, we need to pay appropriate respect to the sacrifice of the animal’s life by eating as much of it as possible. Soooo this is all well and good, but so many of us completely dislike liver… The gag reflex kind of dislike, right? I am with you, or at least I have been. I’m starting to come around to liver (slowly) but my favorite way to include it in the diet is still hidden. Stay tuned for my next post with a delicious “Hide the Liver” Burger recipe that will not disappoint! Do you have ways you incorporate liver into your diet? Share in the comments below. 1. Vague descriptors like bad do not motivate us to action. Take a second and think about this: If you had to give one reason that sugar is bad for you, what would you say? I’m guessing a lot of people would say “because it makes you fat”. That might be true, but it is still very vague. It does not tell you how sugar adds those extra pounds, what being overweight can do to your health, or how the extra weight will prevent you from enjoying your life. Here’s an example of what sugar does in our bodies that is more concrete and specific: Sugar can depress our immune function by inhibiting white blood cell activity, which is necessary for fighting off infection. If you have a big event coming up and are feeling a little under the weather, don’t you think that knowing sugar may prevent you from healing in time for the big day would be more likely to motivate you to pass on dessert than knowing that it’s “bad for you”? 2. When we eat foods we consider bad, we can easily think we are bad. We need to dissociate shame from eating forever. The purpose of food is to give life and heal us physically and emotionally, and the good news is there is an endless host of life giving, delicious foods we can enjoy. But if and when you make decisions to eat foods that are not healing or life giving, YOU are not bad or shameful or disappointing. If you live in the 21st century (which I’m guessing you all do? ;) ) you will unfortunately be put in positions where you have to eat foods that are less than optimal for energy and healing. The BEST thing you can do to maintain a positive relationship with food is to be thankful for all the food that you eat and acknowledge our value is NOT in what we do or don’t eat. The BEST thing you can do to physically help you get the most benefit from ANY food is take a deep breath and enjoy the meal. 3. We can use black & white labels like bad as a crutch to avoid thinking critically about the food we eat. When we label foods as bad – or good for that matter – it removes our need to evaluate whether a food will be appropriate for us based on the context, which generally leads to unintentional decisions. It is more useful to think of all food as having specific consequences in the body. Some foods are healing and energizing, some foods interrupt normal function, some foods actively cause further damage in certain people but not others. Knowing what foods do in our bodies empowers us to make intentional, knowledgeable decisions about what to eat, recognizing the probable effects. For example, if someone tolerates grains well, grains may fall into the “good” category in their mind. However this may lead them to eat something that could be beneficial like quinoa in excess of their metabolic needs, potentially leading to inflammation, weight gain, or other health issues. Alternatively, if someone labels wine as a “bad” beverage and becomes hyper-focused on eliminating “bad” foods, they may miss out on an opportunity to celebrate a special occasion. In both situations if the individual understood the specific consequences of those foods, they may evaluate the benefits to consuming against the likely impact differently. I focus the content of my website on equipping my readers to understand the specific consequences of foods so they can build eating habits around foods that are generally energizing and healing for them, and make informed and intentional exceptions for occasions that THEY determine is appropriate for their lifestyle. Enjoy your next meal! What foods would you like to know more about the specific consequences? Leave me a comment and let me know.